Shop.org 2017, the NRF conference focused on e-Commerce, went down last week. MJD was there both as a participant in the renowned Tech Lab, as well as a group of digital retail geeks excited to check things out. Here’s what we found. Tech Lab was definitely a highlight of the conference. It allowed attendees to experience “technologies of the future” via custom-designed simulations in the store, home, and office. Visitors had a chance to talk directly with startup founders about how their technologies will transfer from the lab to the showroom and full retail stack. To curate the lab, the NRF carefully selected twenty-five emerging technologies that best represent the entire purchase experience including product development, shopper consideration, customer engagement, purchase and post-purchase experience and more. 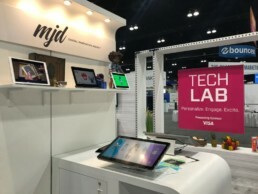 MJD was selected as the sole digital innovation agency to show retailers how to build digital products and experiences that fulfill their brand promise and give them a competitive edge in the hotly contested retail space. Following are four technologies that we could see making an impact in retail over the next couple years. The majority of retailers continue to display products on shelves with only a tiny amount of valuable product information. A couple of the reasons for Amazon’s success is that you can read reviews on products and view how-to videos. That’s tough to do on a physical shelf, but a kiosk with a barcode scanner is a good solution to give customers the information they need to make a purchase. Aila adds additional optics and lighting to an off the shelf iPad, which then enables retailers to build very user-friendly scanning apps on top of iOS. A custom app with Aila’s kiosk hardware is the best possible combination for building a middle of aisle or end of aisle barcode scanning kiosk that we have yet seen. Apple themselves have used their last two product unveiling events to hype Ikea’s new augmented reality application. Augment is a company that is helping bring that functionality to anyone. Augment includes an SDK and platform that allows a retailer to add augmented reality 3D objects to any application. They also offer a 3D view for web e-commerce. This is a great way for retailers to begin prototyping AR technologies. Let’s say you’re walking around on a crowded city sidewalk and you spot some sneakers that you just love. Slyce allows you to use your phone’s camera to scan the shoes and tell you who makes them, what style they are, and where to buy them. This also works in print catalogs and photos. This was a really cool tool that bridges the gap between being inspired by a product you see and actually purchasing it. Slyce is signing up retailers left and right, so look for this app to make big waves in retail. It was a good year for technology innovation at Shop.org, but it did leave us wanting something more. Most of the technology could be classified as a digital tactic, rather than a strategic plan to really disrupt retail. We’re currently working with clients to create digital products and experiences to fulfill their brand promise and tell a compelling story rather than just follow the crowd into the digital jungle. Following tech trends often leads to spending a boatload of money on technology that just doesn’t resonate with customers. The success we’ve been having with clients like American Girl, GoPro, Electrolux and The Container Store all deliver on combining digital with physical spaces to capture imaginations. Doing that leads to customers falling ever deeper in love with their favorite brands, and that is a great way for us to not only compete with threats like Amazon, but win. If that sounds interesting to you, please get in touch. We’d love to help you change the world of retail. Click here for more information on MJD’s Digital Retail Offering. P.S. I got to meet Tyra Banks and she is absolutely delightful.